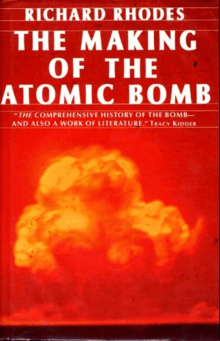 The Making of the Atomic Bomb is a contemporary history book written by the American journalist and historian Richard Rhodes, first published by Simon & Schuster in 1987. It won the Pulitzer Prize for General Non-Fiction, the National Book Award for Nonfiction, and a National Book Critics Circle Award. The narrative covers people and events from early 20th century discoveries leading to the science of nuclear fission, through the Manhattan Project and the atomic bombings of Hiroshima and Nagasaki. Praised both by historians and former Los Alamos weapon scientists, the book is considered a general authority on early nuclear weapons history, as well as the development of modern physics in general, during the first half of the 20th century. Nobel Laureate I. I. Rabi, one of the prime participants in the dawn of the atomic age, called it "an epic worthy of Milton. Nowhere else have I seen the whole story put down with such elegance and gusto and in such revealing detail and simple language which carries the reader through wonderful and profound scientific discoveries and their application." ↑ "Pulitzer Prize Winners: General Non-Fiction". pulitzer.org. Retrieved August 1, 2011. ↑ "National Book Awards – 1987". National Book Foundation. Retrieved February 20, 2012. ↑ The book's entry on Amazon.com has this quote under "Editorial Reviews"
William J. Broad (February 8, 1987). "The Men Who Made the Sun Rise". The New York Times. New York: NYTC. ISSN 0362-4331. Retrieved August 6, 2012. "Reviewed Work: The Making of the Atomic Bomb by Richard Rhodes". The Wilson Quarterly. 11 (3): 149–150. 1987. JSTOR 40257714. "Reviewed Work: The Making of the Atomic Bomb by Richard Rhodes". Social Studies of Science. 20 (3): 565–566. August 1990. doi:10.1177/030631290020003009. JSTOR 285000. Hacker, Barton C. (June 1990). "Reviewed Work: The Making of the Atomic Bomb by Richard Rhodes". The American Historical Review. 95 (3): 935–936. doi:10.2307/2164503. JSTOR 2164503. Collins, Angelo (1988). "Reviewed Work: The Making of the Atomic Bomb by Richard Rhodes". The American Biology Teacher. 50 (8): 532. doi:10.2307/4448825. JSTOR 4448825. Bunn, Matthew (May 1988). "The Bomb's Brilliant History". Arms Control Today. 18 (4): 29–30. JSTOR 23623906. Gruber, Carol S. (22 May 1987). "Reviewed Work: The Making of the Atomic Bomb by Richard Rhodes". Science. 236 (4804): 974–975. doi:10.1126/science.236.4804.974. JSTOR 1699656. Hughes, Sally Smith (1988). "Reviewed Work: The Making of the Atomic Bomb by Richard Rhodes". The Oral History Review. 16 (1): 187–189. doi:10.1093/ohr/16.1.187. JSTOR 3674840. Wang, Zuoyue (October 1989). "Reviewed Work: The Making of the Atomic Bomb by Richard Rhodes". Technology and Culture. 30 (4): 1078–1081. doi:10.2307/3106232. JSTOR 3106232. Bernstein, Barton J. (1990). "An Analysis of "Two Cultures": Writing about the Making and the Using of the Atomic Bombs". The Public Historian. 12 (2): 83–107. doi:10.2307/3378693. JSTOR 3378693.